The Berry Patch is a place in TN where the Berry Family dwell, abiding in Christ and aspiring to become more like Him day-by-day. Devotional Song: … GO TO THIS LINK … Please take the time to take in a YouTube video with song and lyrics from the group Hillsong United singing … Jesus, You’re All I Need … poignantly singing of how Christians live only for the glory of our Lord. … As Satan temps Jesus, who is hungry, having fasted 40 days, the Lord quotes from OT truth that we are sustained by God’s truth. … Jesus holds on to the truth, from God’s word, that man cannot live by bread alone. … God reminds His people that they live for His truth, knowing that He, the Lord, will provide them with their needs. Reference Passage : … Philippians 4:19 [NLT] … 19 And this same God who takes care of me will supply all your needs from his glorious riches, which have been given to us in Christ Jesus. … Trusting God to supply all we need. My Devotional Journal: Today's ODB author, David H Roper, used a story about his grandson to illustrate how material possessions will never satisfy our needs. The ODB author wrote … When our grandson Jay was a child his parents gave him a new T-shirt for his birthday. He put it on right away and proudly wore it all day. “Not as much as yesterday,” Jay replied. That’s the problem with material acquisition: Even the good things of life can’t give us the deep, lasting happiness we so strongly desire. Though we may have many possessions, we may still be unhappy. Reading this illustration of how, as Jesus taught (in Matt. 6 and God’s word in Deut. 8), we will never be completely satisfied - in our souls - with material possessions. It’s what Jesus called out to Satan when the Devil tempted our Lord in the wilderness (see Matt. 4:1-11 and also Luke 4:1-13). And it’s the lesson the ODB author’s grandson learned having been gifted with the T-shirt. And it’s why I’m here every morning, feeding my soul on God’s truth [see photo], … knowing that I need to be sustained by God’s truth every day, which I can feed on from His word. I know, and I pray all reading here also know, that God will supply all my [our] needs (see Phil. 4:19); and, as Hillsong sings, our Lord is really all that we really need. My THANKFULNESS: … Oh Abba Father, … thank You, Lord, … for giving all I need to feed my soul from Your word. Blogger Note: Everyday during this year, my daily devotional blogs are influenced by the reading and study of the online devotional blog entitled “Our Daily Bread,” distributed online via email by RBC Ministries. If you GO TO THIS LINK on the date of my blog, you can read/study the ODB blogs; or you can subscribe to the blog via email at that site. Devotional Song: … GO TO THIS LINK … Please take the time to take in a YouTube video with song and lyrics from the group Sidewalk Prophets singing … Come To the Table … poignantly singing of how God invites all to come to His table. Highlight Verse[s]: Luke 14:23 [NLT] … 23 So his master said, ‘Go out into the country lanes and behind the hedges and urge anyone you find to come, so that the house will be full. … Jesus invites everyone to come to His banquet table. Reference Passage : … Lamentations 3:22-23 [NLT] … 22 The faithful love of the Lord never ends. His mercies never cease. 23 Great is His faithfulness; His mercies begin afresh each morning. … Jesus invites ALL to come with Him to HIs Father’s house in heaven. … God often chooses to invite the lowly to serve Him in His kingdom. 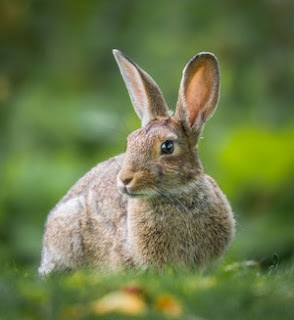 My Devotional Journal: Today's ODB author, Mike Wittmer, used a story about a fire fighter choosing to save a small rabbit to illustrate how our God’s mercy/grace reaches out to invite ALL to join Him at His table. The ODB author wrote … The video showed a man kneeling beside a busy freeway during an out-of-control brush fire. He was clapping his hands and pleading with something to come. What was it? A dog? Moments later a bunny hopped into the picture [see photo]. The man scooped up the scared rabbit and sprinted to safety. How did the rescue of such a small thing make national news? That’s why. There’s something endearing about compassion shown to the least of these. It takes a big heart to make room for the smallest creature. In the linked song today the singing group Sidewalk Prophets sings about God’s invitation to all to join Him at His table in HIs kingdom. And aren’t we glad that we don’t have to be rich, powerful, or even intelligent to join Him [see Scriptures above]? I, for one, am so, SO grateful that he’s invited me. And I”m definitely coming to His banquet! How about you? My THANKFULNESS: … Oh Abba Father, … thank You, Lord, … for Your invitation for me (us) to come to Your party. 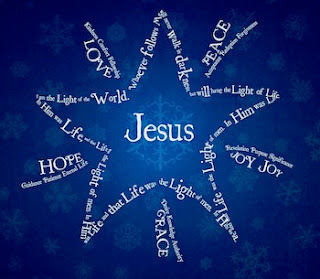 Devotional Song: … GO TO THIS LINK … Please take the time to take in a YouTube video with images and lyrics from Chris Tomlin singing … Light of the World … poignantly singing of Jesus becoming the light of our world. Highlight Verse[s]: Matthew 4:23 [NLT] … 23 Jesus traveled throughout the region of Galilee, teaching in the synagogues and announcing the Good News about the Kingdom. And he healed every kind of disease and illness. … Jesus moved out to shine His light into the darkness of Galilee. … Jesus moved out from Nazareth into Galilee, preaching the Gospel and bringing the Light of the World to those in darkness. Reference Passage : … Psalm 119:105 [NLT] … 105 Your word is a lamp to guide my feet and a light for my path. … Now we have God’s light, shining on our path in life, thru His word. Reference Passage : … Isaiah 9:2 [NLT] … 2 The people who walk in darkness will see a great light. For those who live in a land of deep darkness, a light will shine. … The promise and prophesy of the Light of Messiah who would come to God’s people, shrouded in the darkness of sin. … Jesus commanded His disciples to shine His light in the world for others to see the glory of God’s love/grace in the way we live our lives. … Jesus declares Himself to be the “Light of the World” to bring them out of their darkness. My Devotional Journal: Today's ODB author, Arthur Jackson, used a story about a musician to illustrate how we can shine the light of Christ thru the way we live. The ODB author wrote … On the streets of Los Angeles, a homeless man struggling with addictions stepped into The Midnight Mission and asked for help. Thus began Brian’s long road to recovery. As the ODB author writes today following this story, Jesus was the fulfillment of those prophesies from Isaiah 9 about His light coming into the world to lead His people out of the darkness of their own sin. And when Jesus moved out from his home town into the countryside in Galilee and began sharing the Gospel of His kingdom with those who flocked to see Him, He became God’s Light, … His living word, … shining the light of truth and leading those who would surrender to Him out of their darkness and into His light. And that’s what any of us can find in following Him. It’s certainly what led me out of the darkness of my selfishness and sin over 3 decades ago; and now I can seek and share His light of truth (see Ps. 119:105) with others here everyday and praying that we all will simply follow His light and reflect it into the world (see Matt. 5:14-16) so that others will follow the Lord’s light out of their own darkness. I pray that all reading here are seeking His light of truth daily and sharing that light with others. My THANKFULNESS: … Oh Abba Father, … thank You, Lord, … for the light of truth shining from Your word. Devotional Song: … GO TO THIS LINK … Please take the time to take in a YouTube video with song and lyrics from Steven Curtis Chapman singing … His Strength Is Perfect … poignantly singing of how God’s strength, when we walk in the Spirit, will give us His strength to cover our weaknesses. Highlight Verse[s]: Isaiah 40:31 [NLT] … 31 But those who trust in the Lord will find new strength. They will soar high on wings like eagles. They will run and not grow weary. They will walk and not faint. … It is those whose trust holds in the strength of God’s grace who will finish the race well. … God, thru Isaiah shows where we can get our strength when we grow weak or weary in life. Reference Passage : … Isaiah 41:10 [NLT] … 10 Don’t be afraid, for I am with you. Don’t be discouraged, for I am your God. I will strengthen you and help you. I will hold you up with my victorious right hand. … We need not be fearful in running the marathon we run in life; because God’s mighty right hand is there to lift us up when we get weak. … Jesus invites those who trust in Him to find rest in Him. Reference Passage : … 2Corinthians 12:9 [NLT] … 9 Each time He said, “My grace is all you need. My power works best in weakness.” So now I am glad to boast about my weaknesses, so that the power of Christ can work through me. … When Paul was weakened in the flesh, He learned to rely on God’s empowering grace to give him the strength to go on. Reference Passage : … 2Timothy 4:7 [NLT] … 7 I have fought the good fight, I have finished the race, and I have remained faithful. … At the end of his life, the Apostle Paul, testifies to his finishing the race faithfully. My Devotional Journal: Today's ODB author, Arthur Jackson, used a personal story to illustrate how we can find strength from God’s empowering grace when we get weak in running the race of life. The ODB author wrote … At the age of fifty-four I entered the Milwaukee marathon with two goals—to finish the race and to do it under five hours. My time would have been amazing if the second 13.1 miles went as well as the first. But the race was grueling, and the second-wind strength I’d hoped for never came. 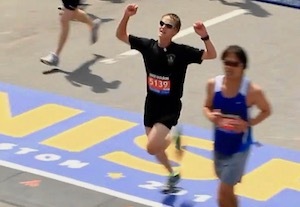 By the time I made it to the finish line [see photo], my steady stride had morphed into a painful walk. Footraces aren’t the only things that require second-wind strength—life’s race does too. As I write this, this old runner, like Paul, writing to Timothy in 2Tim. 4, is in the last legs of the marathon we call life. I don’t know where my readers are in your race; but I do know that there are times when we all feel like we “hit the wall,” and our endurance to run the race we call life can wane. It is then when we find out just how much we trust in God’s promises (see highlight and reference passages) to help us finish the race. And I pray, again like Paul, that we know - and trust - that God’s promises are true [see Isaiah 41:10 and 2Cor. 12:9] … that our God will, as Steven Curtis Chapman sings, give us His strength to go on when we feel weak. And I need some of His empowering grace today. How about you? My THANKFULNESS: … Oh Abba Father, … thank You, Lord, … for Your uplifting strength when I get weak. Devotional Song: … GO TO THIS LINK … Please take the time to take in a YouTube video with song and lyrics from the group Selah singing that great Andre Crouch song … The Blood Never Loses Its Power … poignantly singing of how Christ’s completed work, shedding His blood on the cross, will never lose it’s power to save and cleanse us from our sins. Highlight Verse[s]: Jeremiah 2:22 [NLT] … 22 No amount of soap or lye can make you clean. I still see the stain of your guilt. I, the Sovereign Lord, have spoken! … Nothing we can do can cleanse us from the stains of our sin. 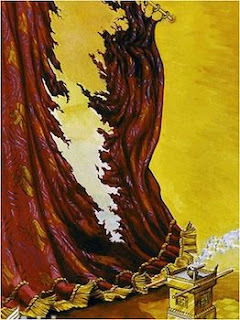 … God, thru Jeremiah, declares the sin stains of His people [and that’s us, too!]. … For those who need it (and that’s all of us - see Rom. 3:23), God’s mercies are new every morning … BUT … we have to be willing to surrender to its sustaining/cleansing power thru confession and repentance. Reference Passage : … Psalm 32:5 [NLT] … 5 Finally, I confessed all my sins to you and stopped trying to hide my guilt. I said to myself, “I will confess my rebellion to the Lord.” And You forgave me! All my guilt is gone. … When we’re willing to confess and repent of our sin, God will forgive and cleanse the stain of ALL SINS - FOREVER. … When Jesus declared “It is finished” from the cross and dies, His blood had forever become the cleansing agent for all the sins of mankind … past, present, and future. Reference Passage : … 1John 1:7, … 9 [NLT] … 7 But if we are living in the light, as God is in the light, then we have fellowship with each other, and the blood of Jesus, his Son, cleanses us from all sin. … 9 But if we confess our sins to Him, He is faithful and just to forgive us our sins and to cleanse us from all wickedness. … All we need do now is confess our sins to Him directly and be cleansed. My Devotional Journal: Today's ODB author, Lisa M Samra, used a personal story to illustrate how we are all permanently stained by sin with only the blood of Christ to cleanse us. The ODB author wrote … I couldn’t believe it. A blue gel pen had hidden itself in the folds of my white towels and survived the washing machine, only to explode in the dryer. Ugly blue stains were everywhere. My white towels were ruined. [see photo] No amount of bleach would be able to remove the dark stains. As I reluctantly consigned the towels to the rag pile, I was reminded of the Old Testament prophet Jeremiah’s lament describing the damaging effects of sin [see highlight passage]. The truth of Romans 3:23 [look it up if you don’t know it!] resounds in the hearts of all of us. We ALL have sin-stained hearts; and there’s only one way for those stains to be cleansed; and that is by receiving the sin-cleansing power of God’s Spirit when we confess and repent of our sins, … receiving the cleansing blood of Christ, which, as the linked song powerfully sings, … will never lose its power … to cleanse us completely (see 1John 1:7,9). My THANKFULNESS: … Oh Abba Father, … thank You, Lord, … for Your blood which cleanses me (and all of us) of the stains of sin. Devotional Song: … GO TO THIS LINK … Please take the time to take in a YouTube video with song and lyrics from Natalie Grant singing … Clean … poignantly singing of how God sees all and is willing and able to cleanse us from all confessed sin. … David cleansed of the sin, but not absolved of the consequences of the sin. … David’s sin revealed and confessed; and God’s mercy/grace to cleanse David. … God’s mercies are new every morning … IF … we’re willing to let them work in our lives by humble and honest confession and repentance. … When we’re willing to confess and repent of our sin, God will forgive and cleanse - FOREVER. … Jesus declares “It is finished” from the cross and dies, doing all that was necessary to cleanse any repentant sinner of his/her sin. Reference Passage : … 1John 1:9 [NLT] … 9 But if we confess our sins to Him, He is faithful and just to forgive us our sins and to cleanse us from all wickedness. My Devotional Journal: Today's ODB author, Jennifer Benson Schuldt, used a story of some modern technology that helps us reveal what is going on in our lives. 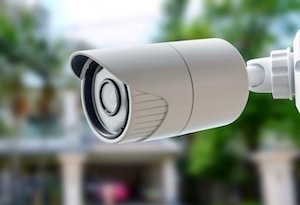 The ODB author wrote … When a man installed a security camera outside his house [see photo], he checked the video feature to ensure that the system was working. He was alarmed to see a broad-shouldered figure in dark clothing wandering around his yard. He watched intently to see what the man would do. The interloper seemed familiar, however. Finally he realized he wasn’t watching a stranger roam his property, but a recording of himself in his own backyard! What might we see if we could step out of our skin and observe ourselves in certain situations? As with King David, hiding in the darkness of his unconfessed sin (see highlight passage), sometimes it takes the eyes of someone else, to help us see, confess, and repent of our sin. But also as with David, when we do, God, thru Jesus’ completed work on the cross (see John 19:28-30), is willing and able to cleanse us of that sin (see Psalm 32:5 and 1John 1:9) … COMPLETELY! So, knowing that God is our ultimate security camera and sees all, … is there anything we need to confess and let our Lord cleanse us today? My THANKFULNESS: … Oh Abba Father, … thank You, Lord, … for Your mercies which are new to me every day. Devotional Song: … GO TO THIS LINK … Please take the time to take in a YouTube video with song and lyrics from the group Selah singing that great Andre Crouch song … The Blood Never Loses Its Power … poignantly singing of how Christ’s completed work, shedding His blood on the cross, will never lose it’s power to save us from our sins. … Jesus’ completed work on the cross now allows us to come directly to Him to be cleansed of our sins. … When Jesus dies on the cross, a new way to come to Him was opened. … Jesus cries out one last time from the cross and dies; and at that moment the veil over the Holy of Holies in the Temple was torn, opening the way for us to come directly to Him for atonement of our sins. … Jesus declares “It is finished” from the cross and dies. Reference Passage : … 1Corinthians 6:19-20 [NLT] … 19 Don’t you realize that your body is the temple of the Holy Spirit, who lives in you and was given to you by God? You do not belong to yourself, 20 for God bought you with a high price. … Because of Jesus paying the price on the cross, WE are now the Temple of His Spirit. … All we need do now is confess our sins to Him directly and we are cleansed. My Devotional Journal: Today's ODB author, Dave Branon, used the Good Friday story to help us remember how the blood of Jesus now allows us to come directly to Him, rather than to bring sacrifices to the Temple. The ODB author wrote … It was a dark and somber day in the outskirts of Jerusalem. On a hill just outside the city walls, a Man who’d been attracting crowds of eager followers for the past three years hung in disgrace and pain on a rough wooden cross. Mourners wept and wailed in sorrow. The light of the sun no longer brightened the afternoon sky. And the intense suffering of the Man on the cross ended when He cried out in a loud voice, “It is finished” (John 19:30). At that very moment, another sound came from the great temple across town—the sound of ripping fabric [see photo]. Miraculously, without human intervention, the huge, thick veil that separated the outer temple from the holy of holies tore in two from top to bottom (Matthew 27:50-51). It is “GOOD” Friday … when we celebrate the worst - and best - moment in human history, … that time when Jesus cried out … ”It is finished!” … from the cross and gave up His life so that we, who believe in Him as Messiah and Lord, can now come directly to Him rather than having to bring our sacrifices to the Temple for remission of our sins. At the moment Jesus died for our sins on the cross, the veil, covering the entry to the Holy of Holies in God’s Temple, was torn [see Matt. 27:50-52], … and dead men came out of the grave. Now, … all of us can now come directly to Jesus, … no longer having to bring our sacrifices to the Temple for atonement of our sins. We, who are saved by His blood, are now the Temple of God’s Spirit (see 1Cor. 6:19). Now, by the shedding of Christ’s blood, in that completed act on the cross, He has made a way for us to confess our sins and be cleansed completely and forever [see 1John 1:9]. Do I sense my readers joining me in a resounding … HALLELUJAH! … And I pray we all have a glorious Good Friday!! My THANKFULNESS: … Oh Abba Father, … thank You, Lord, … for Your completed work on the cross. April 14, 2019 … So Many Questions!! I've been called to lead Battle Plan Ministry (see my personal website). And this gig of being "PawPaw" to four beautiful little girls is a wondrous gift from God.